Author Warren ThrockmortonPosted on November 16, 2014 Categories Religion, ResultSourceTags David Jeremiah, Jamie Munson, Kevin Small, Mark Driscoll, Mars Hill Church, Paul Joiner, ResultSource, Sutton TurnerLeave a comment on Why Did ResultSource Need David Jeremiah's Ministry to Help Get Mark Driscoll on the New York Times Best Seller List? Did David Jeremiah Use ResultSource to Make the New York Times Bestseller List? As we now know, in the case of former Mars Hill pastor Mark Driscoll, working with Small to market his book meant buying his way on to the bestseller list. Mars Hill’s contract with ResultSource called for the purchase of thousands of books in ways that made it appear that the books were being purchased by individuals. Did David Jeremiah, his church, or his Turning Point ministry make a similar arrangement? I asked Turning Point three times about this beginning early last week but received no answer. According to an internal Mars Hill Church memo on ResultSource I have obtained, ResultSource CEO Kevin Small outlined the details of the preparation for a New York Times Bestseller campaign to Mars Hill Church’s executive elders in June 2011. 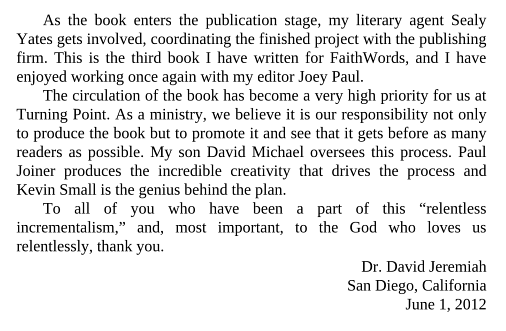 One part of the strategy was to set up a website to solicit donations in exchange for a book. The pitch in the case of Real Marriage was that the Mars Hill Church member could donate over $25 to get a free book with any profits going to the church. However, since the books had to be purchased at retail, not much actual profit went to the church. Mark Driscoll’s staff warned about how it would look if the ResultSource deal was ever discovered. An unanswered question is: What was the plan? We know what Driscoll did; did Jeremiah do the same thing? He hasn’t answered. I have obtained information which indicates that other Christian authors have used ResultSource to crack the NYT list. I will post more on this topic throughout the week. I also have reaction from a Christian publisher and the New York Times. 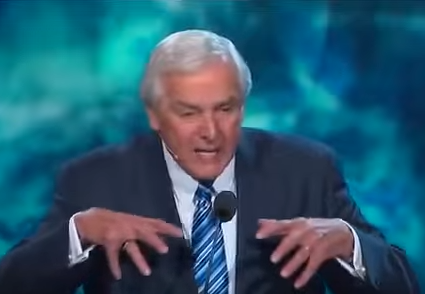 *Turning Point is David Jeremiah’s broadcast ministry. Author Warren ThrockmortonPosted on November 10, 2014 Categories Professional issues, ReligionTags David Jeremiah, Kevin Small, New York Times Bestseller List, Paul Joiner, ResultSourceLeave a comment on Did David Jeremiah Use ResultSource to Make the New York Times Bestseller List?